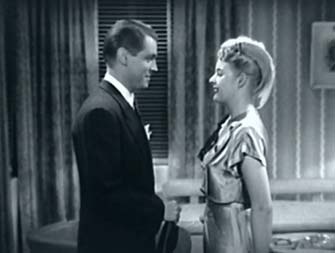 P.R.C.’s MEN ON HER MIND suggests Mary Beth Hughes is going to be her usual hard boiled blonde, but not at all. It’s a light hearted story with several songs. ( I think Mary Beth was dubbed). She plays Lily Durrell a sweet,trusting young woman who has been brought up in an orphanage and has stayed on to help with the younger children. But she really wants to be a singer. The lady who runs the orphanage (she is only ever referred to as ‘Mother Goodwin’) advises Lily that marriage and parenthood are a woman’s greatest career. But she gives her blessing to Lily who, for some unknown reason, decides to leave the orphanage in the middle of the night! The film is told mainly in flashback and through letters Lily writes to ‘Mother Goodwin’ . The film actually opens with Lily on her first radio show,singing “Heaven on Earth”. She has three suitors – a rich,older man Roland Palmer (Alan Edwards), a sophisticated rogue,Jeffrey Wingate (Edward Norton) and a young school teacher,Jim Lacy (Ted North). They all want to meet her after the show. Then the flashback starts, from the time when Lily leaves the orphanage and gets a lift from a lorry driver who falls for her (of course) and gets her a job in a laundry! His family close in and eventually she’s on the go again. She gets an audition at the Club Savoy and sings ‘Once Around the Clock’ for the manager. They are interrupted when a mysterious woman bursts into the manager’s office and shoots him dead in front of Lily! Lily,in a panic, flees. This time she goes to secretarial school and lands a job with Roland (the older man at the start of the film). His snooty sister tries to get rid of her,but Roland gets her singing lessons (which she really doesn’t need) – and cue for another song,’Ave Maria’. When the bad sister threatens to investigate Lily’s past, Lily leaves again and immediately meets Jeffrey (Edward Norris) – (this film is pure P.R.C., not a second wasted! ). He not only gets her a singing job but finds out that the real killer of the club manager has confessed. (Phew, Lily’s off the hook). Jeffrey falls for her ( she really is a siren!) and gives her a diamond bracelet which Lily reads has been stolen. So, again,she heads for the hills (the bus station actually) and here she meets Jim Lacy (Ted North),a music teacher who mistakes her for a physical education instructor and drives her to the girls’ school where she is an immediate success. Jim of course falls for her and conceals the letter from the real teacher who has turned down the post. Jim also arranges the return of the stolen bracelet to its owner. Lily decides she cant go on pretending at the school and being in the habit of leading places at night, she starts off but is stopped by Jim. He knows she wants to be a singer and gives her a song he has written, ‘Heaven on Earth’. Her older suitor Roland finds her at the school (heaven knows how) and tells her his sister is sorry, and that he has a radio contract for her. So,end of flashback. All three men are waiting in different locations for Lily to join them, and she chooses the man she loves! (Clue, in real life Mary Beth was married to Ted North). I know I’ve made fun of it, but MEN ON HER MIND is an enjoyable fairy story. It’s Mary Beth Hughes’s film and she is very good,though I prefer her smart and sassy. Thank you,Jenni. Very kind of you. Mary Beth Hughes’ voice was not dubbed for this picture. Thank you . Good to know the talented Mary Beth could sing too.